The ornate castle architecture and interiors of the Momoyama period were a reflection of both a feudal lord’s power and a new aesthetic sense. During the Momoyama period (1573–1603), Japan underwent a process of unification after a long period of civil war, and rulers Oda Nobunaga and Toyotomi Hideyoshi built castles as symbols of their power. Typically, castles build during this period consisted of a central tower or tenshu surrounded by gardens and fortified buildings. The dark interiors of castles were often decorated by artists, and the spaces were separated using sliding fusuma panels and byōbu folding screens. 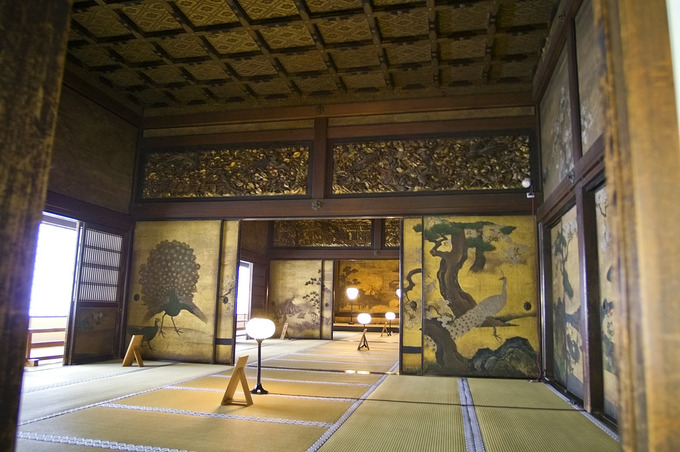 The ornate castle architecture and interiors, adorned with painted screens embellished with gold leaf, marked a clear departure from the somber monotones favored during the previous Muromachi period. The shoin style, or a style of Japanese residential architecture that forms the basis of today’s traditional-style Japanese houses, had its origins within the earlier Muromachi period and continued to be refined during the Momoyama period. Ōsaki Hachiman-gū (大) is a Shinto shrine in Aoba-ku, Sendai, Miyagi, Japan and is a fine example of Momoyama architecture. hip-and-gable: An East Asian style of roof architecture in which a hip roof slopes down on all four sides and integrates a gable on two opposing sides; it is usually constructed with two large sloping roof sections in the front and back respectively, while the two sides each are usually constructed with a smaller roof section. During the Momoyama period (1573–1603), Japan underwent a process of unification after a long period of civil war. It was marked by the rule of Oda Nobunaga and Toyotomi Hideyoshi, men who built castles as symbols of their power: Nobunaga in Azuchi, the seat of his government, and Hideyoshi in Momoyama. The Ōnin War during the previous Muromachi period had led to the rise of castle architecture in Japan. By the time of the Momoyama period, each domain was allowed to have one castle of its own. Typically, castles during this period consisted of a central tower or tenshu surrounded by gardens and fortified buildings. All of this was set within massive stone walls and surrounded by deep moats. The dark interiors of castles were often decorated by artists, and the spaces were separated using sliding fusuma panels and byōbu folding screens. Byobu: A six-panel byōbu folding screen from the 17th century painted with nature imagery. Matsumoto, Kumamoto, and Himeji (popularly known as the White Heron castle) are excellent examples of the castles of the period, while Nijo Castle in Kyōto is an example of castle architecture blended with that of an imperial palace, to produce a style that is more in keeping with the Chinese influence of previous centuries. Matsumoto: Matsumoto Castle in Matsumoto, Nagano, completed in 1600. The shoin style, or a style of Japanese residential architecture that forms the basis of today’s traditional-style Japanese houses, had its origins within the earlier Muromachi period and continued to be refined during the Momoyama period. Verandas linked the interiors of residential buildings with highly cultivated exterior gardens. Fusuma (vertical rectangular panels that can slide from side to side) and byōbu (folding screens) became highly decorated with paintings, and often an interior room with shelving and an alcove (tokonoma) was used to display art work (typically a hanging scroll). Ōsaki Hachiman-gū (大) is a Shinto shrine in Aoba-ku, Sendai, Miyagi, Japan and is a fine example of Momoyama architecture. The main shrine building (社 shaden) is the oldest extant structure in which the worship hall and the main sanctuary are interconnected under the same roof in the shape of an H (a structure known as ishi-no-ma-zukuri). 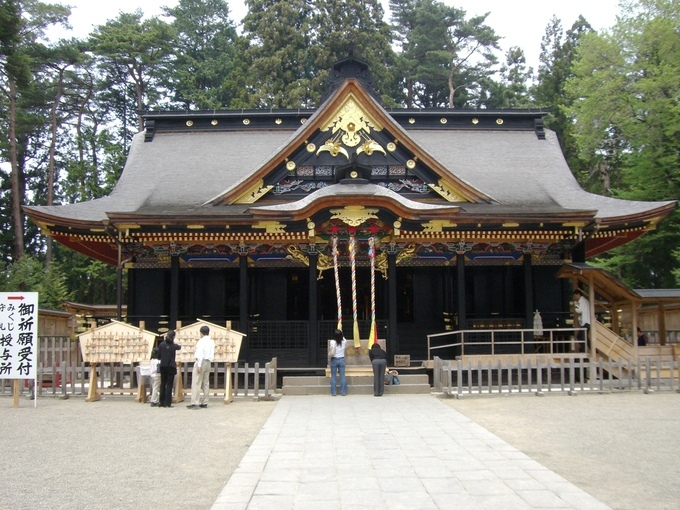 It is a single-storied structure consisting of a main sanctuary (honden) and a worship hall (haiden), which are joined via a connecting passage called ishi-no-ma. All three structures are under a single roof covered with shake shingles. The sanctuary and worship hall are both built with a hip-and-gable roof, to which a simple gabled roof of the ishi-no-ma connects. On the front of the building is an attached triangular dormer with a decorative bargeboard of concave shape; the entrance is covered by an elaborate canopy. Ōsaki Hachiman-gū shrine in Sendai city: The main shrine building is an example of Momoyama architecture. A shoin is a type of audience hall in Japanese architecture that was developed during the Muromachi period and refined during the Momoyama period. Shoin originally referred to a study and a place for lectures on the sūtra within a temple, but later it came to mean simply a drawing room or study. The emerging architecture of the Muromachi period was subsequently influenced by the increasing use and appearance of shoin. One of the most noticeable changes in architecture to arise from the shoin came from the practice of lining the floors of the room with tatami mats. The architecture surrounding and influenced by the shoin quickly developed many distinguishing features, such as the tokonoma (an elevated recess built into the wall to display art) and chigaidana (shelving structures built into the tokonoma to display smaller objects). Occurring at the same time as the development of shoin architecture was the rise in popularity of fusuma, or sliding doors used to divide rooms. tatami: Straw matting, in a standard size, used as a floor covering in Japanese houses. sūtra: An aphorism (or line, rule, formula) or a collection of such aphorisms in the form of a manual or, more broadly, a text in Hinduism or Buddhism. tokonoma: A recess in a domestic interior in which a hanging scroll, flower arrangement, or other art is displayed. fusuma: A vertical rectangular sliding panel, often painted or decorated, used in Japan as a door or movable wall. A shoin (書, drawing room or study) is a type of audience hall in Japanese architecture that was developed during the Muromachi period. The term originally referred to a study and a place for lectures within a temple, but later it came to mean simply a drawing room or study. The shoin-zukuri style takes its name from these rooms. In a shoin-zukuri building, the shoin is the room dedicated to the reception of guests. The Shiro-shoin at Hongan-ji: Shoin is a type of audience hall in Japanese architecture. The foundations for the design of today’s traditional Japanese residential houses were established in the late Muromachi period and refined during the ensuing Momoyama period. Shoin-zukuri, a new architectural style influenced by Zen Buddhism, developed during that time from the earlier Heian period’s palaces and the subsequent residential style favored by the warrior class during the Kamakura period. One of the most noticeable changes in architecture to arise from the shoin came from the practice of lining floors with tatami mats. Since tatami mats have a standardized size, the floor plans for shoin rooms had to be developed around the proportions of the tatami mat; this in turn affected the proportions of doors, the height of rooms, and other aspects of the structure. Before the shoin popularized the practice of lining floors with tatami mats, it had been standard to only bring out a single tatami mat for the highest-ranking person in the room to sit on. The architecture surrounding and influenced by the shoin quickly developed many other distinguishing features. Because guests sat on the floor rather than on furniture, they were positioned at a lower vantage point than their Chinese counterparts at that time, who were accustomed to using furniture. This lower vantage point generated such developments as suspended ceilings, which functioned to make the room feel less expansive and also resulted in the ceilings rafters no longer being visible, as they were in China. The new suspended ceilings also allowed for more elaborate and ornate decoration. Other characteristics to arise from the lower vantage point were the tokonoma and chigaidana. The tokonoma was an elevated recess built into the wall to create a space for displaying Chinese art, which was popular at the time, at a comfortable eye level. The chigaidana, or “staggered shelves,” were shelving structures built into the tokonoma to display smaller objects. Fusuma, or sliding doors, were also becoming a popular means to divide rooms. As a result, columns began to be created that were square-shaped to accommodate the sliding doors. The asymmetry of the tokonoma and chigaidana pair, as well as the squared pillars, differentiated the shoin design from the contemporary Chinese design of the time, which preferred symmetric pairs of furniture and round pillars. Soon after its advent, shoin architecture became associated with these evolving elements as it developed into the predominant format for formal gathering rooms. The art of the tea ceremony flourished during the Momoyama period and was influenced by Zen principles of imperfection and transience. The Momoyama period saw the budding of what is generally regarded as Japanese traditional culture as we know it today. The Japanese tea ceremony developed as a transformative practice centered around the aesthetic of wabi-sabi , a concept derived from Zen Buddhism that emphasizes simplicity, humility, impermanence, and intense appreciation of the immediate experience. Murata Jukō is known as the founder of the tea ceremony as a spiritual practice. He was the first to emphasize the concept of wabi-sabi in the aesthetic of the ceremony. Sen Rikyū (1522–1591) is the most famous and revered tea master in the history of the tea ceremony. His teachings perfected many newly developed forms in architecture and gardens, art, and the full development of the Way of Tea. Sen Rikyū emphasized several key aspects of the ceremony, including rustic simplicity, directness of approach, and honesty of self; he was also responsible for the creation of hand-moulded Raku teabowls. chanoyu: A traditional Japanese tea ceremony in which matcha is prepared and presented. wabi-sabi: A Japanese aesthetic that derives from imperfection and transience. The Japanese tea ceremony or chanoyu, also known as the Way of Tea, is a Japanese cultural ritual involving the cemeronial preparation and presentation of matcha or powdered green tea. Loose leaf green tea or sencha is also used, but far less commonly. Zen Buddhism was a formative influence in the development of the tea ceremony. The art of the tea ceremony flourished during the Momoyama period (ca. 1568–1603). Both Oda Nobunaga—the initiator of the unification of Japan under the shogunate in the late 16th century—and his successor Toyotomi Hideyoshi lavished time and money on this pastime, collecting tea bowls and other implements, sponsoring lavish social events, and patronizing acclaimed masters of the tea ceremony. By the 16th century, tea drinking had spread to all levels of society in Japan. Sen Rikyū (1522–1591) is perhaps the most well-known and still revered figure in the history of the tea ceremony. He was driven by the concept of ichi-go ichi-e, a philosophy that each meeting should be treasured, for it can never be reproduced. His teachings perfected many newly developed forms in architecture, gardens, art, and the full development of the Way of Tea. He also reestablished and emphasized several key aspects of the ceremony, including rustic simplicity, directness of approach, and honesty of self. The principles he set forward—harmony, respect, purity, and tranquility—are still central to the tea ceremony today. The tea ceremony flourished during the Momoyama period: An open tea house serving matcha (right) and a peddler selling decoctants (left). The monk clothing depicts the relationship between matcha culture, tea ceremony, and Buddhism. The Japanese tea ceremony developed as a transformative practice and began to evolve its own aesthetic over the years. Murata Jukō is known as an early developer of the ceremony as a spiritual practice; he studied Zen Buddhism under the monk Ikkyū, who revitalized Zen in the 15th century, and this is considered to have influenced his use of the Zen concept of wabi-sabi in the aesthetic of the tea ceremony. “Wabi” represents the inner spiritual experiences of human life. Its original meaning indicates quiet or sober refinement, or subdued taste characterized by humility, restraint, simplicity, naturalism, profundity, imperfection, and asymmetry. “Sabi,” on the other hand, represents the outer material side of life. Originally, it meant “worn,” “weathered,” or “decayed.” Together, wabi-sabi emphasizes simplicity, humility, consciousness of impermanence, and intense appreciation of the immediate experience, and this was reflected in the aesthetics of the tea ceremony. Tea equipment is called chadōgu. A wide range of chadōgu are available and different styles and motifs are used for different events and in different seasons. All of the tools for the tea ceremony are handled with exquisite care. They are scrupulously cleaned before and after each use and before storing, and some are handled only with gloved hands. Some items, such as the tea storage jar “chigusa,” were so revered that they were given proper names like people. The pottery used for the tea ceremony is often simple and natural, in accordance with wabi-sabi, and came to transform the manner in which the Japanese viewed ceramic ware. Tea master Sen Rikyū was involved in the innovation of Raku teabowls with the collaboration of a tile maker named Raku Chōjirō, prompted by his preference for simple, rustic items made in Japan rather than the expensive Chinese ware that was in fashion at the time. These hand-moulded and glazed vessels have become intimately connected with the tea ceremony and are still in use to the present day. The chakin, a small rectangular white linen or hemp cloth mainly used to wipe the tea bowl. The tea bowl, available in a wide range of sizes and styles, with different styles used for thick and thin tea. Shallow bowls, which allow the tea to cool rapidly, are used in summer, while deep bowls are used in winter. Bowls over four hundred years old are in use today. The best bowls are thrown by hand, and irregularities and imperfections are prized and often featured prominently as the “front” of the bowl. The tea caddy, a small lidded container in which the powdered tea is placed for use in the tea-making procedure. The tea scoop, generally carved from a single piece of bamboo, ivory, or wood and used to scoop tea from the tea caddy into the tea bowl. Different styles and colors are used in various tea traditions. The tea whisk, used to mix the powdered tea with the hot water and typically carved from a single piece of bamboo.